Earlier this week (7.12.15) we revealed our brand new Waltons Space Shed. The sci-fi inspired space shed was custom built by our new product development team. We are huge fans of sci-fi movies here at Waltons and we challenged our product development team to create a space inspired building. The shed must look like it’s come straight out of a sci-fi movie! The team based the design around a traditional wooden potting shed or greenhouse which typically features large styrene windows, shelving and ventilation. To give the potting shed a ‘space ship style’ look the team took a standard rectangular structure and re-imagined it as a hexagonal structure which almost looks curved. The final design gave the building quite substantial size of 9ft x 7ft! The roof height is just under 7ft so even the tallest of adults can stand up in it comfortably. In order for the building to be strong the team decided to use a tongue and groove style cladding and constructed the building like they would any other garden building, in panels. It took the team around a week from design to completion to construct the space shed. To decorate the shed we painted the outside in Cuprinol Forest Mushroom and the inside has been painted in Cuprinol Urban Slate. 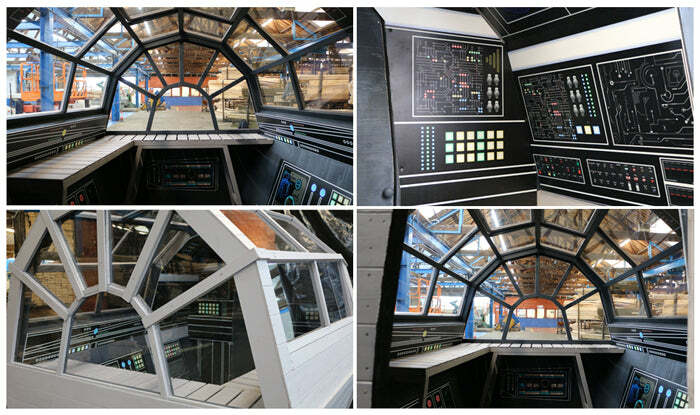 To make it really stand out our in-house graphic designer created mock control panels printed on foam boards which cover the inside of the shed so that when you are inside you really feel like you are on your very own space ship. Take a closer look at the Space Shed in this video tour. Although we based the design on the potting shed we have been told that it could even be used as a mini gaming room or as a teen hang out area. The possibilities are endless we are really proud of the finished space shed and we hope that everyone else loves it too! Check out the story of when we gave the Space Shed to our local city farm!